At the end of a terrace in the small market town of Usk, upon the river of the same name, sits the most extraordinary fishing tackle shop in Britain. Sweets Fishing Tackle has been trading on Porthycarne Street for nearly a century, and little has changed in that time. 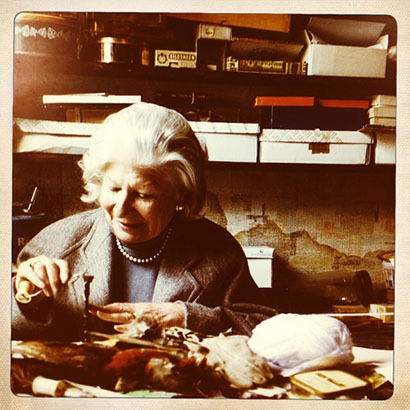 Originally founded by Harry Powell, inventor of the Dogsbody Fly (see Back of the Shed), Sweets took its name from subsequent owners Molly and Lionel Sweet, and catered principally for the flyfishers visiting the local beats of the rivers Usk and Wye. In the 1960’s Jean Williams began working in the shop, and in 1978, after the passing of Molly and the help of a bank loan, Jean became the new owner. She is still tying flies and welcoming customers 37 years later. Earlier this year, photographer Nick Fallowfield-Cooper visited Sweets in order to immerse himself within the unique nostalgia of this very special place. He filled up his fly-box, wrote some words, and took some breathtaking snaps, which you can see for yourself in Fallon’s angler Issue 3.